Someone has said, "Honesty and transparency make you vulnerable. Be honest and transparent anyway." It's clear from the first line of the first track of Phil Laeger's newest release that opening up his spiritual and personal journey is exactly what he intends. "I'm swimming fast from the wreck...", sings Laeger, setting the tone for the remainder of the songs, though not in the way you might expect. Themes of grace, hope and redemption permeate Honestly, an album which fits squarely in the musical genre of Christian pop-rock. Honestly doesn't leave the listener on auto-pilot though, with some pleasant thematic and musical variance: the piano interlude "Into the Light", which is easy to imagine as the basis of a film score; "Boy Become a Man", a beautiful ballad in which Phil bares his heart about his desire to be a good father and raise good sons; the funky "Do What You Want To", complete with sax/horns/clav/claps breakdown and background murmur; and finally the emotive "Won't Forget You", with production reminiscent of Jars of Clay. "Well done" - I wanna hear You say, "Well done"
Phil's cover of "When I Hear the Praises Start" by Keith Green (an obvious influence) takes nothing away from the original and is an easy front-runner for the first single. Meanwhile, "Where Else Could I Go?" (echoing Peter's words to Jesus found in John 6:68) brings to mind the lyricism of the Christian muse Rich Mullins, as Phil sings "Follow Me, come on and leave everything, come on and lay down your dreams, take up your cross and die. Place your bets on a kingdom you can't see yet, on a Pauper who paid your debts, whose death has brought you life." 9 - Where Else Could I Go? 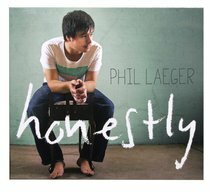 Phil Laeger is an independent Christian artist from Atlanta, Georgia, currently living in Melbourne, Australia. In 2005, Phil co-wrote the National Day of Prayer Theme Song in the States with Rebecca St James. In 2008, Micah Challenge Australia featured Phil's song "Beggar's Hand" on the Heart Life VOICE project, an album of worship that speaks of God's compassion for the marginalized. His latest release, Honestly, produced by Dove award-winning producer Dan Hannon, was released March 15th, 2010. I love music that speaks about the journey of life, celebrating the highlights and lifting us for the low lights. I am drawn to music that feeds my soul and spurns me on. Laeger's music does this and comes from a deep place. A place of honesty and humility. This album is another great work giving us all great music to encourage us on the journey of faith.